Let's continue exploring more stuff about KVM virtualization on Ubuntu (remember that there have been posted two previous articles, I and II). We will start with an interesting characteristic: cloning existing virtual machine images with identical virtual hardware configurations. This is a typical operation because it is normal that we have to install several times the same operating system for different functions. For example, we can need three servers running under a Linux distribution: mail, web and data storage. For this purpose, first we would make a virtual machine with that Linux OS, then we would clone that virtual machine twice and finally, we would install the rest of services on the base systems. The following order generates a new virtual machine named cloned_BT, from BackTrack4 domain. It is necessary to specify the hypervisor by means of the --connect parameter and to have turned the virtual machine off. We can also perform this task through the Virtual Machine Manager. Other interesting feature is related to the possibility of saving a running domain into a state file, with the aim of being able to be restored later. When we execute this operation, the domain will be automatically switched off. 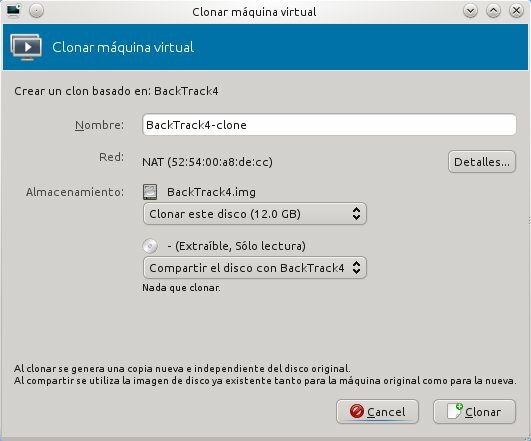 We can use for example this characteristic to back up our virtual machine before a critical task, such as a system update. Therefore if we want to restore a domain from a state file, we will add the restore option (the virtual machine must be turned off). And finally, I will present another useful tool in order to show the state of the virtualized domains. This utility is similar to top. We can also get certain information about a concrete virtual machine selecting the Performance console, in the Virtual Machine Manager.